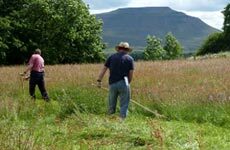 Broadrake is in the heart of the Yorkshire Dales National Park Three Peaks district, at the foot of Whernside with spectacular views to Ribblehead and Ingleborough. It is on the Dales High Way long distance path and just a stone’s throw from the famous Three Peaks Challenge Walk. There are numerous walks to be done from the door and Broadrake lies on a popular bridle way for mountain bikers. The area round about is pot holing mecca and there are show caves nearby for a taste of the underground. 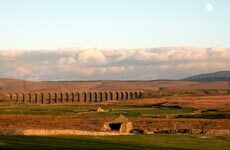 Botanists, geologists, photographers and artists will find plenty of interest and rail enthusiasts will love the view of Ribblehead viaduct. The village of Ingleton with shops, cafes and its famous waterfalls walk is a short distance away. 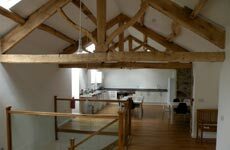 Bunkbarn Accommodation Upstairs is a super open plan communal area with original feature beams and amazing views of the slopes of Whernside. 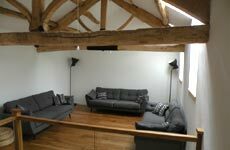 There are comfy sofas, kitchen and dining facilities, a small resources room and an upstairs toilet. On the ground floor are five bedrooms, one 8 bed, 2 x four bed and 2 x twin rooms, a drying room and a shower block with 2 showers, two toilets and a combined shower / toilet. Free wifi and bike storage are available.